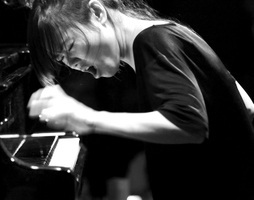 "Hiromi is changing the musical landscape. Her music, charm and spirit let her soar to unimaginable heights. She is nothing short of amazing." So says her mentor, Ahmad Jamal. When she was 17 she was introduced to Chick Corea by teachers. He asked her to play. The next day, at his Tokyo performance, he invited her on stage to improvise with him. The masterful Oscar Peterson recalls in his journal how he marveled "at her command of the instrument, along with her harmonic ideas and unbridled technical control." Great artists recognize greatness. This week, at Jazz Alley, Hiromi mesmerized her audience with inventiveness, dynamic range, faultless time, and confident command of the club's beautiful new Steinway. She captivated the Bent photographer with her beauty, poise, angular approach to the piano... and remarkable music.